By having a small collection of cables and adaptors on hand, you can easily over come these nightmares. A simple collection of common video adaptors, power cables, accessories and even basic stationary items should be collected and be kept on hand at your User Group meeting. Whilst most projectors support VGA and more modern ones also support DVI and/or HDMI inputs, it seems that every second or third generation of computer and laptop have a new video output socket. Unfortunately, these adaptors are easily left behind at the office or lost, so by your User Group having a spare on hand, you can quickly get a presenter back on-screen. You’ll also want a handful of audio cables and adaptors on hand in order to be able to connect your presentation machine up to the meeting room audio system. If your budget stretches far enough, consider having at least two of each lead — one around 30cm (or a foot) long and one that is at least a meter long, or better still 2m or 5m long. This will give you the most flexibility for connecting devices. If you still have some older DVI-VGA adaptors and the mini-VGA to VGA adaptors used on older iBooks and Powerbooks, throw them in to your kit as well… but perhaps place them in a separate carry bag. You just never know who may still need one. And as technology changes and new adaptors are needed for new machines, add them. But don’t throw away your old adaptors — move them to another storage pouch and keep them on hand just in case… after all you’ve already paid for them, but you never know when you may still need one. It doesn’t matter how many power points there are in a room there are never enough available, and/or they aren’t conveniently positioned, so having a selection of extension cords and power boards (also known as power strips) are an essential component to any Presentation Kit. Extension Cords: Have a couple of different lengths handy. I recommend you have at least one each of a 1m, 5m and 10m extension cable. Perhaps consider including a couple of the shorter ones. When running extension cords, remember to consider the OH&S aspects and use Gaffer Tape to secure them as required. Powerboards: Have at least one 4-socket power board in your Presentation Kit. Considering basic power boards can be purchased for around $5 each these days, you should really include a couple of them in your Presentation Kit. Another thing to consider is the length of the actual cord available on the power board itself – most come with a 1m or shorter cord which is usually fine, but there are versions available with longer cords and these may mean you can forego having a separate extension cord in your kit. 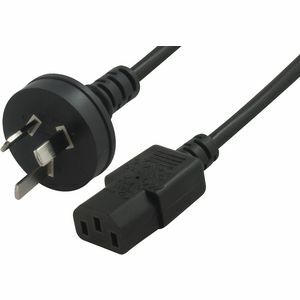 Computer Power Cable: Officially known as a Female IEC-C31 Socket this power cable is commonly used to power computer, projectors and audio systems and it is disappointing how often one is needed but not on hand 🙁 Having a couple of these spare in your Presentation Kit is absolutely essential! You might as well throw a IEC-C7 to Mains Plug, otherwise known a Figure-8 cable, in to your Presentation Kit, as some portable speakers and projectors use them. 12w iPhone/iPad Charger: With the popularity of using iPads and even iPhones as a presentation machine these days, it is wise to include a 12w USB charger in your Presentation Kit, along with a Lighting cable and still keep a 30-pin Dock cable handy for those who are using older iPads or iPhones. I recommend the 12w chargers as they will keep an iPad 4 or even an iPad Pro fully powered and actually charging even when the device is active. They will also charge older devices, but the 5w charger for an iPhone or the older 10w chargers included with earlier iPads may not be charge and power the newer devices. Batteries: Have a selection of AA, AAA and 9v batteries to be able to replace batteries in microphones, presentation remotes and other devices. If you use rechargeable batteries, make sure you recharge them after use and keep a charger with the kit. 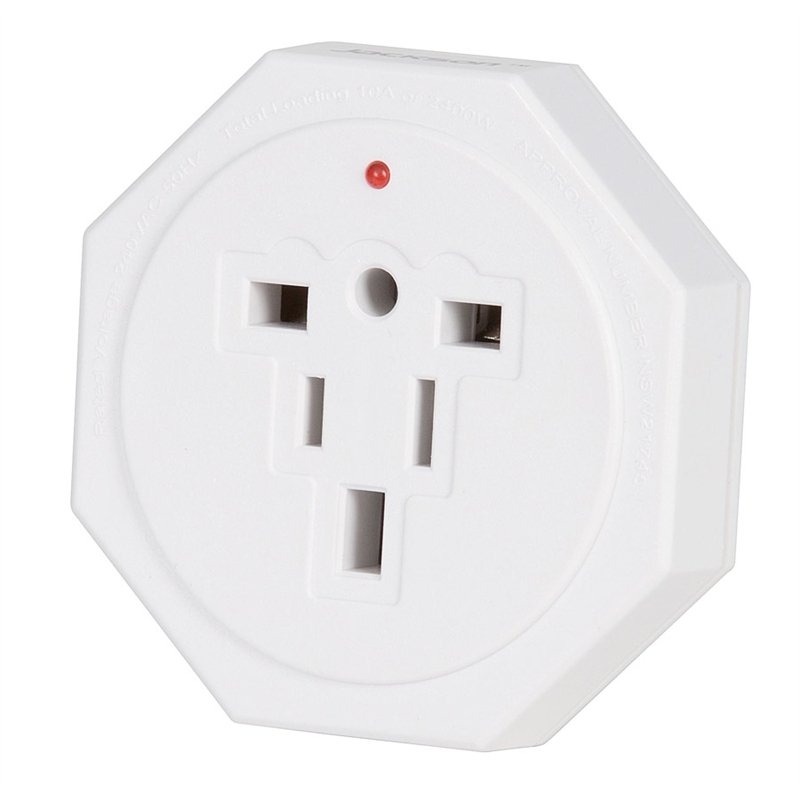 Universal Travel Adapter: The Universal Travel Adaptor shown converts USA, UK, Japanese and European power plugs for use in Australia and New Zealand. It is important to note that these adaptor do not convert voltage, so if your appliance is dual voltage make sure it is switched to 240V and if your appliance is 110V only you must use a transformer. It’s not often needed in Australia but when you suddenly need one, you’ll be glad you spent the AU$10 to have one on hand. European, US and Asian User Groups will almost certainly want to the appropriate adaptor for their country as it more likely that you’ll have a Presenter visiting from a neighbouring country. Another essential, yet often overlooked, set of equipment every Presentation Kit should contain is a keyboard and mouse! It might seem redundant as most presenters tend to a laptop, or maybe an iPad, for their presentation machine. But the number of times a keyboard just won’t work, or the laptop itself needs to placed in an unusual position that makes typing difficult will amaze you. When I was discussing recommendations with one of my former Technical Support Officers, for recommendations for this part of this article, we couldn’t decide between including a wired keyboard and mouse set or a wireless set. Considering OfficeWorks has a Wireless Keyboard and Mouse Set for AU$15 and Wired Keyboard and Mouse for AU$24, it’s not going to break the bank to have both sets included in your presentation kit. There are also a number of silicon keyboards available as wired or BlueTooth options that roll up quite compactly to save you some space in your Presentation Kit. 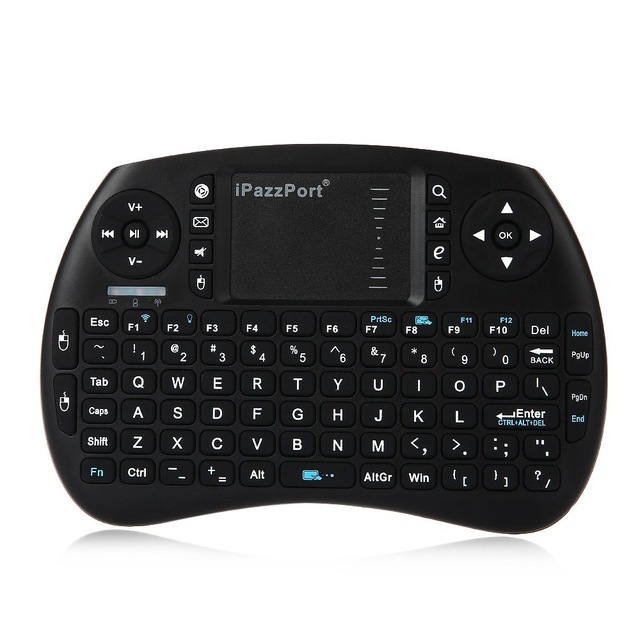 Since originally publishing this article, I’ve discovered the iPazzPort Mini Bluetooth Wireless QWERTY Keyboard Mouse Touchpad w/ Backlit Model KP-810-21BTL which is a hand held size integrated keyboard and trackpad. It also includes special function keys including Volume and Media Control (Play/Pause, Forward, Previous). 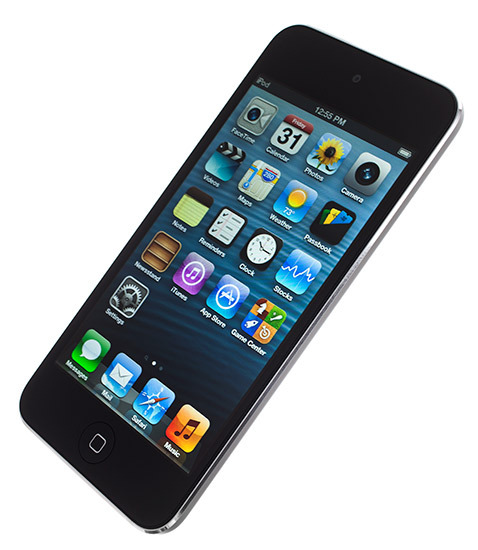 It uses standard Bluetooth 3.0 for its’ connection, so in addition to connecting to a Macintosh, it will also pair with iOS devices like the iPhone, iPad and even a latter model AppleTV. It can be purchased from a number of eBay traders for approx AU$25 – search for “ipazzport KP-810-21BTL”. There is a slightly cheaper non-lit model, but we highly recommend the back-lit model for use with presentations. Just remember to have charged batteries available for the wireless devices. And also include a mousepad in the kit! Ensure your Presentation Kit includes a USB Thumbdrive, ideally 8GB or larger. This can be used to transfer files from one computer to another if needed. Just as importantly it can store some useful files and documents that you may need to call upon if you suddenly switch machines. Fonts: All the presentations your Apple Ambassador can access from the Apple Sales Website use special fonts, so you should keep a copy of theses font files on your thumb drive. For ASW presentations released prior to early-2017 the font family “Myriad Set” was used, whilst after early-2017 the font family changed to “SF-Hello”. Both of these fonts collections can be downloaded by your Apple Ambassador from the ASW. Likewise if you use any custom fonts for your group presentations, keep a copy of these fonts on the drive as well. Royalty Free Music: Sometimes it is useful, or just pleasant, to have some background music playing as people enter and settle in to your meeting room prior to the presentation commencing. I’ve also been known to play music very loudly in between multiple presentations and after a presentation to help “encourage” people to move out of the room [Turning off the room lights is not a recommended method due to safety concerns]. So have a few pieces of music as .mp3s handy can be useful and there are plenty of options for obtaining royalty free music that can be used in these environments. I recommend MP3s over .AAC files as they are still more compatible with different music players and speaker systems. Desktop Background: If you have a custom Desktop Image that contains your User Group logo you may want to keep a copy of this on your thumb drive. Have it available in a number of popular sizes including 800×600 (not common these days, but some people still occasionally use it), 1024×768 (which will most likely be the most commonly used), 1280×720 (720p TV) and 1920×1080 (1080P TV). Alternatively just make two hi-res ones… one in a 16:9 widescreen ratio and the other as a 4:3 standard aspect ratio and select the appropriate aspect and let the OS handle the scaling. Test Image: Another useful image to have on your thumb drive is the old Kodak Photo CD Printer Calibration Image. 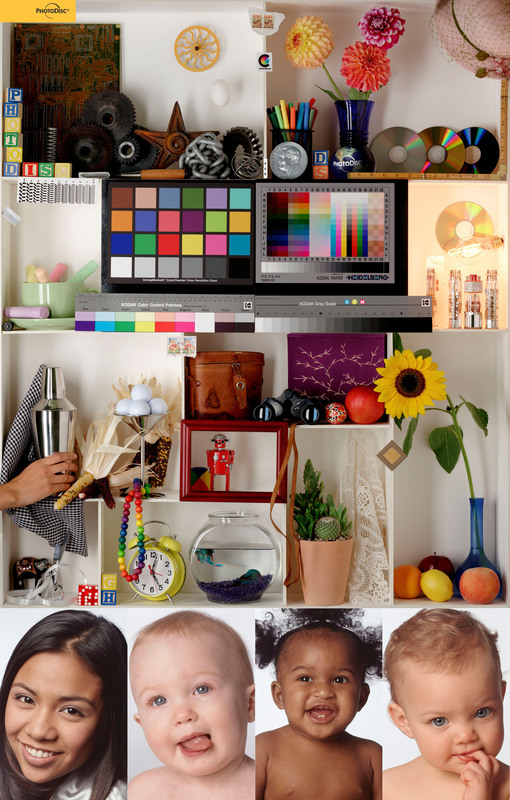 This can be used to see how well different colours appear on your projector or monitor. You’d be amazed at how often you, or your presenter, will need a pen and piece of paper to jot a note down. You can also use the note pad or Post It Notes to conduct an ad hoc raffle draw. When it comes to notepads look at having at lease two different types — one that you can easily tear pages out of and one that is firmly bound. Use the easily torn out one for raffle tickets, “name out of a hat” draw, or passing a note on to someone else. The firmly bound notebook is ideal for writing down your own notes and reminders. 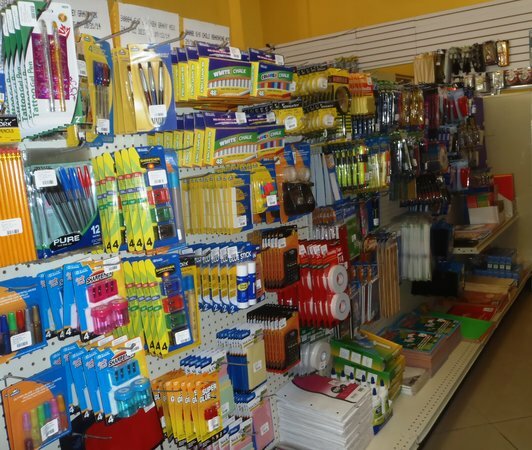 You are less likely to loose a A5 or A4 sized notebook compared to a single sheet of paper. If your meeting room has a whiteboard then having your own packet of assorted coloured whiteboard markers and a whiteboard eraser can be handy… I’ve often founds the ones left on the ledge by the meeting room provider are dried out, or there are none. A whiteboard can be useful for writing URLs up for members to copy down or for the presenter to write a reminder of a topic to come back too that’s been raised in a question. TIP: Place the Whiteboard Eraser in its own SEALED pencil case to prevent the “dust” from covering everything else in your kit. When it comes to Gaffer Tape, spend an extra few dollars and purchase a decent brand as they will tear easier than the cheaper brands when dispensing it and also have better adhesive properties without leaving residue on cables and other surfaces when you remove it. Scotch Tough Duct Tape No Residue is a good brand to consider. Built-in Messages App: If the Presenter is using their own iPhone or iPod touch as a Keynote Remote, you can use Messages to silently send them reminder messages about remaining time etc. Built-in Clock: For using the stopwatch to keep track of timing points within a presentation. Helps you keep track of where you should be up and then you slow down or speed up the pace of the presentation. Remote: If you uses iTunes on your presentation machine to play music as people enter your meeting room, then you can use this app to remotely control the volume, skip tracks etc. It also allows you to control an Apple TV. Apple Keynote: Provides a backup device to present from if required, but mainly for using the Keynote Remote function to control your main presentation machine. Airport Utility: For configuring your Presentation Airport Base Station. Find My Friends: Your Catering Officer or the key holder to the building hasn’t turned up and isn’t answering their phone, then Find My Friends might show that they are on their way and they can’t answer as they are driving. This will need to be pre-configured as the security of the app requires the followed person to agree to it first. OpenSignal: Allows you to find nearby free WiFi hotspots and test the true speed of your WiFi Connection. MacTracker: A really handy reference tool about virtually every Mac and other Apple machines and accessories. Can be really handy to check system specifications and port types included on an unknown machine the guest presenter has brought along. LEDit – The LED Banner App: Allows you to display quick reminders to the presenter like the time they have remaining. Best Sand Timer: A nice visual display of a countdown timer. iTalk Recorder: Allows you to record audio from the presentation, which can then be used for a podcast, or for your Meeting Recorder to recall information for their presentation review. Writie Talkie: Allows to send text messages (and voice messages) over a local Bluetooth or WiFi connection – no need for a cellular data nor full internet connection. Useful for sending silent reminders to the presenter that time is almost up etc. Dropbox: Allows you to quickly access documents you have stored up on Dropbox. This may be access codes and passwords to servers etc, or even a brief biography about your current presenter. Tablecloths: “Of all things to include in a Presentation Kit, why tablecloths?” I hear you ask. You’d be surprised just how often these can come in useful. The most obvious use is to cover unsightly cables and equipment — simply drape over the table and place cables etc under the table. They can used to cover windows that are allowing sunlight or other light sources to drown out projection screens. I’ve even used them to cover up an item that I want to show off as a “surprise” during a presentation. So having a couple of different sized cloths can be of use to you. 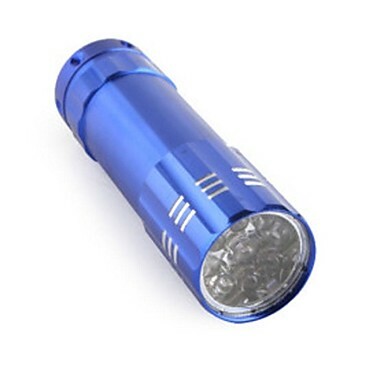 Torch: A small LED torch can be purchased for under $5 these days from $2 shops, Bunnings and even supermarkets or petrol stations. Yes most phones include a torch option these days, but often a dedicated torch can easier to utilise and handle. Try and store it in the front pocket of your Presentation Kit bag for quick access. Powered USB Hub: Many computers, especially laptops, often only have a couple of USB ports readily accessible and more and more devices contact via USB and thus you can quickly run out of ports, or a USB-bus powered device may draw more power than your computer can supply causing all USB devices to fail. It is now common to see a USB dongle for mobile data internet connection, a thumb drive with the presentation contained on it and a USB dongle for a wireless presentation remote or keyboard and mouse, or even for audio out. A simple 4-port powered USB hub solves these issues! Make sure it is a POWERED hub… you’ll be glad you spent the few extra dollars on it. 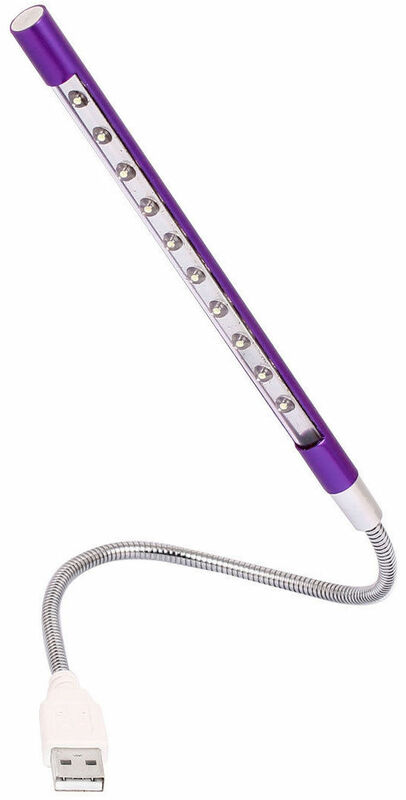 USB LED Lamp: These handy little lamps can be purchased from various sellers on eBay for under $10 and having one in your Presentation Kit can make a presenters life a lot easier if they need to read physical notes or use an unlit keyboard. You don’t have to power these from a laptop or computer USB port — you can just as easily power them from a Powered USB Hub or even from a small USB battery pack (like the ones travellers use to recharge their iPhones). I’ve even seen people use these attached to a battery pack to light a small table to the side of the presentation area that contains a pitcher of water and glass so the presenter can see as they pour a drink in an otherwise darkened or dimmed room. Physical Presentation Remote: Whilst I highly recommend the use of the Keynote Remote feature on the iPhone, having a physical Apple Remote or similar remote like the Kensington Wireless Presenter can easily allow your presenter to roam the “stage” area of your meeting room without been stuck behind a lectern or desk when presenting. Many Presentation Remotes also include a laser pointer, so if you need to purchase a new remote for your Presentation Kit, you might as well consider one with a laser pointer. Also be sure to know how to pair and unpair an Apple Remote. AppleTV: A third or fourth generation AppleTV can be a very simple way of hooking an iPhone, iPad or even Mac up to a large TV or projector using AirPlay. If you have multiple presenters at your meeting, this option can often save the hassle of switching cables in and out between presentations. 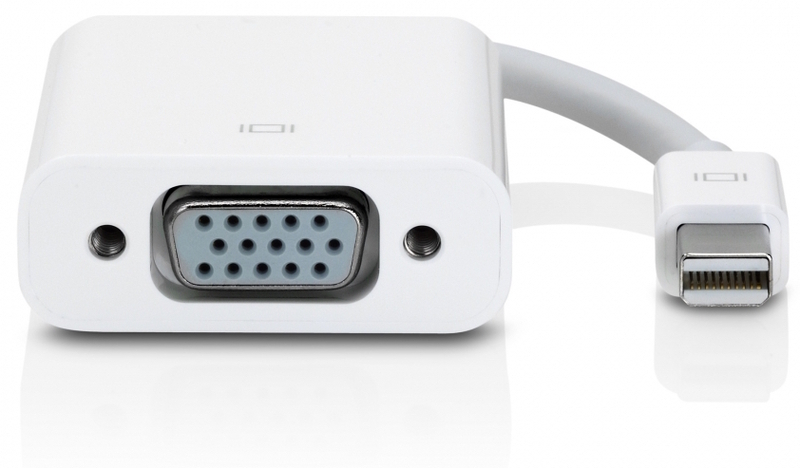 You may also want to include a VGA-HDMI adaptor in your kit as well so you can connect the AppleTV to older projectors that only have VGA inputs. The Kanex Pro X Cable is the industry (and Apple’s) recommendation, but there are cheaper options out there. 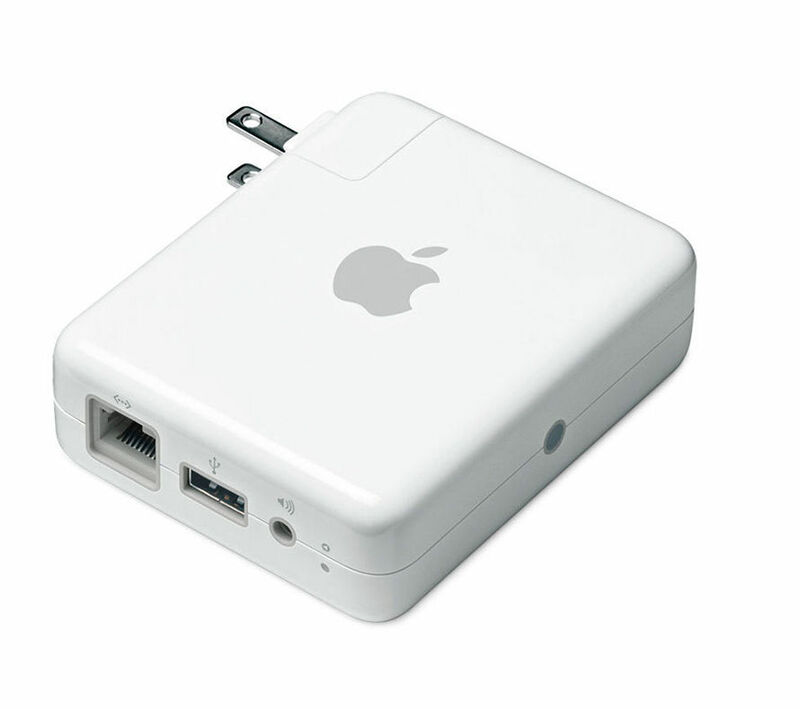 Airport Express & Ethernet cables: Having a dedicated “Presenters Network” can be advantageous in many circumstances, but it is most useful for pairing an iOS Device running Keynote as a Remote for your main presentation machine. Likewise if you are using an AppleTV you can easily limit access to it by controlling who has access to this private network. Also, have a couple of Cat-6 ethernet cables stored away in your Presentation Kit. As with other cables we have mentioned have various lengths on hand, say a few 1m cables and at least one 10m or even 20m cable. You just never know when a WiFi password might suddenly change on you. Some meeting venues also provide additional access to things like Printers, Servers or even dedicated high speed internet access for machines connected to ethernet at the presentation console compared to WiFi connected clients. You can often connect your own Airport Express to this dedicated cable to provide WiFi to your presenters. Projector and Sound System: Your meeting venue may already have a projector and/or a sound system included that you can use, but it can still be handy to have your own available as backup. Even if your meeting venue comes pre-equiped with a projector, having a second projector available can open up a lot of possibilities for expanded presentations or quick switching between presentations. But the main reason I recommend you have your own projector on hand is the number of times I’ve seen the main projector been out of commission for various reasons — usually the bulb blew or the connection port box was left locked and as most User Groups meet in the evening or on the weekend, the appropriate support staff from the venue weren’t present to fix the problem bringing the entire presentation to a halt. 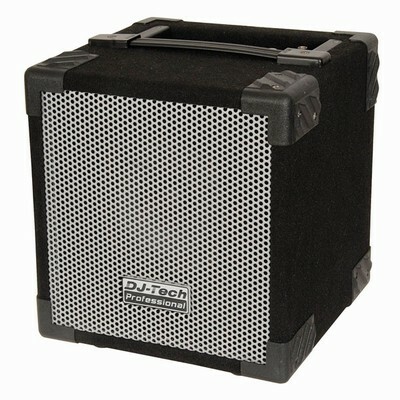 A couple of years ago I recommended the DJTECH Cube 50 Portable Rechargeable Speaker with Amplifier as a great, yet inexpensive solution for Australian Apple User Groups. Whilst this is still listed on Jaycar’s website at a substantially reduced price of just over $100 it has been “out of stock” for a while. But it gives you an idea of the type of sound system and associated accessories you should consider for an small to medium sized meeting venue. 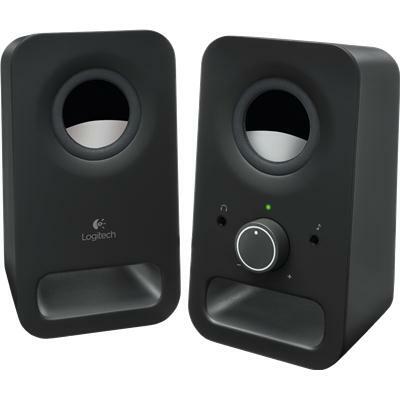 Basic Computer Speakers: Even if you have a dedicated sound system, having an inexpensive set of basic computer speakers in your Presentation Kit can save a presentation that includes a short video or audio clip. All too often I watched a short promo movie the Presenter has included in his presentation, only not to be able to hear it as there was no audio amplification from the computer itself. A $10 or $20 set of stereo speakers would have resolved this problem. Don’t worry about sets with sub-woofers has they only take up valuable space in your bag and have extra cables to plug in. 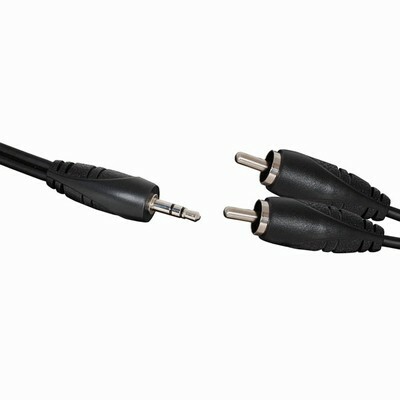 Many new computer speakers are connected via USB, but a good old fashion 3.5mm audio plug from the speakers plugged into the computers headphone socket is still the simplest way to connect speakers. Once you have collected all these adaptors, cables and accessories together you’re going to need somewhere to store them and a small suitcase with wheels and an extendable handle is probably the simplest way to achieve this and is what I personally use as mine has a couple of pockets on the outside front, plus one in the lid. Also having the handle and wheels makes it easy to transport. I’ve seen others use a ordinary backpack, because they can carry it over their shoulders, freeing up their hands for other things but I personally find it more difficult to find small adaptors in a backpack – you tend to have to take the entire contents out as the one you’ll be looking for will inevitably always be on the bottom. Having your Presentation Kit stored in suitcase means you can usually just open the main lid and have ready access to most of the equipment with minimal digging. The one exception I’d consider is a professional photographic camera backpack as these usually have adjustable pockets and compartments and open like a suitcase. 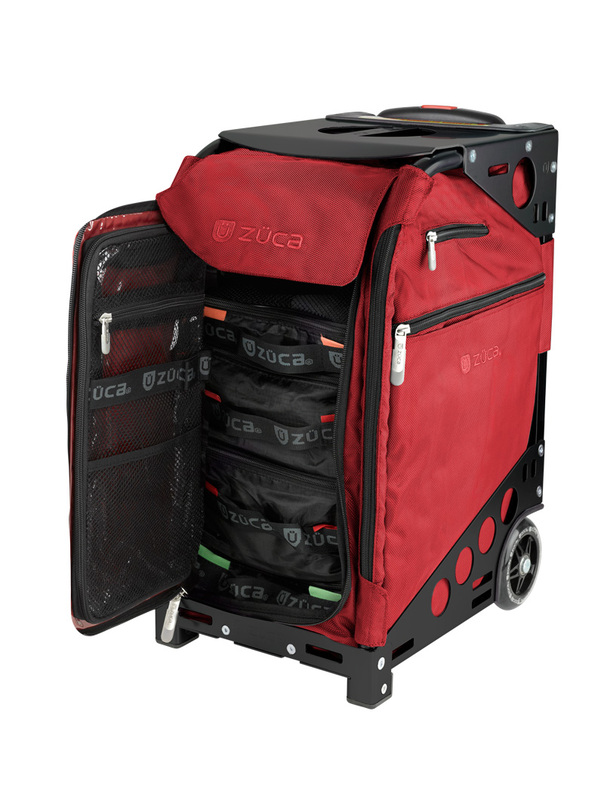 If I was purchasing a new case to store my own Presentation Kit I’d be seriously looking at something like a Zuca Pro Travel Case or maybe the Zuca Pro Business Case for the storage of my adaptors and smaller accessories. They aren’t the cheapest case out there, but they are specifically designed for such a purpose. I like the Pro Travel Case because it includes a couple of different size pouches that are different colours making it easy to identify which pouch you are looking for. It’s also a compact size which is great from both storage and transporting. Plus it can sit neatly on a counter (away from the presentation “stage” area) for easy access. 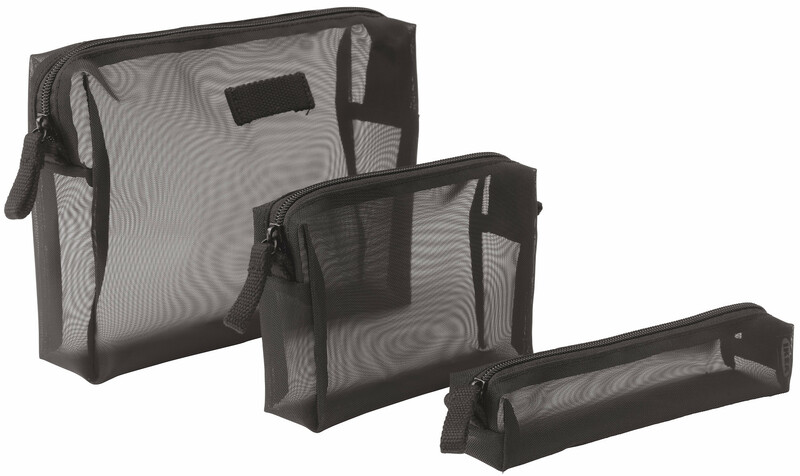 If the suitcase you have for your Presentation Kit doesn’t already have its own pouches then it would also be worth purchasing some small accessory bags to separate the different types of cables and accessories. IKEA has a set of three accessory bags called FÖRFINA for under AU$15 and a couple of these sets are ideal. They are available in different colours, so grab a couple of different colours making it easier to identify the different accessory or cable packs. Projector: Obviously the projector itself, the primary video cable (normally VGA or HDMI), the video adapter for your primary presentation machine and a long power extension cord (either 5m or 10m depending on the your primary meeting room. Sound System: The speaker itself, all the microphones, mic stands and basic audio cables, plus a long power extension cable. If you place the speaker near the projector table then you may wish to substitute the extension cord for a power board. Other Cables & Accessories: Place all your backup adaptors, accessories and cables that you don’t use each meeting, but still need to keep on hand in case of an emergency, into a separate bag. Keep this bag handy, but not in the presenters way. Include clearly printed and laminated lists of what should be contained in each bag and even look at using colour coded cable ties attached to both ends of cables etc so that all the Green tagged equipment goes in the Projector bag, anything with a Blue tag or label goes with the Sound System, whilst the stuff with Red cable ties are placed in the Emergency Assorted Cables and Accessories bag. Place the appropriate cable tie on the handle and perhaps on one of the zippers of the actual Presentation Kit bag for easy association. You can even print your Inventory Lists on the same coloured paper! 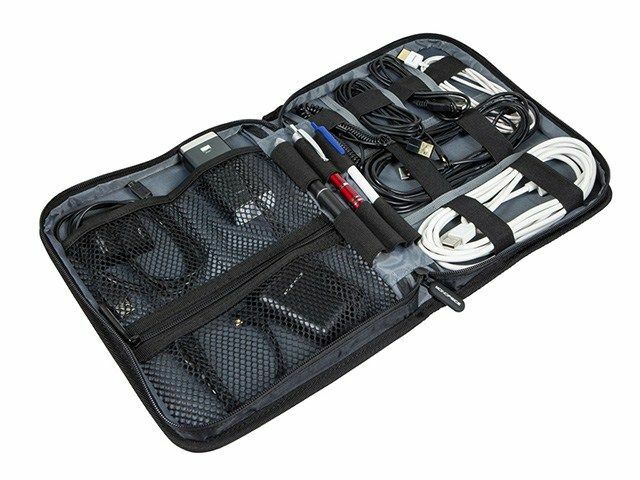 Also, something to consider to reduce the physical size of all your cables and thus the size of the case you need to store it all, you could look at getting retractable cables. Once you have gathered all your cables, adaptors and accessories together and placed them in a suitable carry case or two, you need to ensure that it isn’t been raided constantly by other projects. Remember it is supposed to contain everything and anything that you may need to access in hurry to get a presentation up and running and this can’t happen if someone has “borrowed” that particular adaptor to get the Office Manager’s machine working during the month. If another machine needs a cable, accessory or adaptor to work permanently then you should be purchasing a dedicated one for that! Also, you need to decide how and where you going to store the Presentation Kit in-between your meetings and it all depends how many meetings you have each month and how many different venues your meetings are held in. And you basically have two choices — Store onsite at your meeting venue during the month OR at one of your members home and they bring it to each meeting. 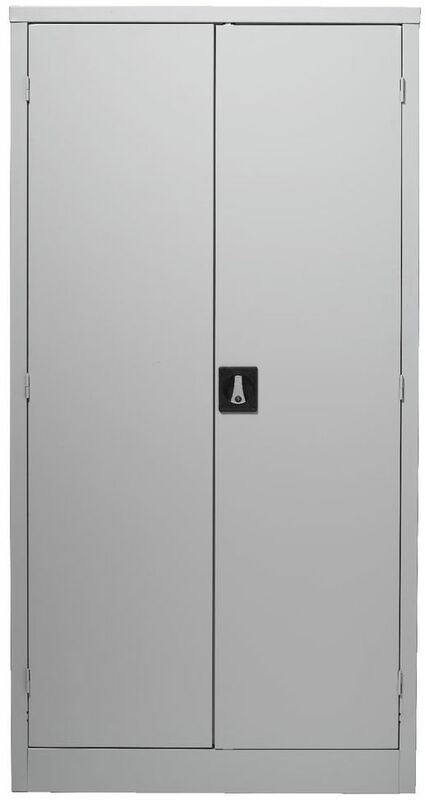 If you have just one meeting venue for all your meetings, then you maybe able to negotiate with the venue management for your group to permanently place a lockable Stationery Cabinet in an out of the way position on the premises. Alternatively, some venues will be able to provide access to a pre-existing cupboard or locker that you can add your own padlock to. If you can’t arrange for a cabinet on site, or your group has multiple meetings at different venues then your only option is to have one of your members house the Presentation Kit in between meetings. Worse case scenario is you may have to compile multiple Presentation Kits – one for each venue. Ideally the person who has volunteered to house the Presentation Kit will be someone nearby the meeting venue and that they can easily arrange to have it passed on to, or collected, by another member if they can’t attend a particular meeting. 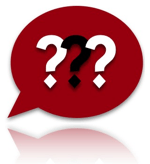 If you have multiple sessions within happening simultaneously within the same building, i.e. an Advanced Users in Room 1 and a separate Beginners Group in Room 2 then you probably only need one Presentation Kit but perhaps have a couple of each of the more common adapters and cables in the kit. Also ensure that the Presentation Kit comes to EACH meeting… even if you haven’t needed anything from it for the last six, or even 12 months, the one time you didn’t have it on hand you just know that Murphy’s Law is going kick in! Do I really need everything listed above??? At the end of the day, you know what equipment your meeting venue provides and what devices your presenters typically use, so focus on the primary items you know from your own experience you may need to have on hand. Also, you don’t have to race out and buy everything at once. Some of the stuff you may already have lying around and thus you just need to consolidate it into one central storage case. A few items you may want to purchase immediately, but the rest can happen over time. Often your own members will have some older surplus equipment gathering dust at home that they could donate to your group. I know of one group that uses an ancient UFO Airport Base Station to provide their Presentation Network — this works just fine for pairing their old iPod Touch running the Keynote Remote to the presentation laptop and it cost the group nothing to include in their presentation kit as a member donated it after upgrading to a new Time Capsule a few years ago. And did you notice that the most vital element of any ordinary Presentation Kit isn’t actually listed above??? I have deliberately NOT listed a Presentation Machine, be that a MacBook, iPad, or even a iPhone, as something that should be included in your User Group’s Presentation Kit! The assumption is your Presenters will provide their own machine with their own custom software configuration and all the elements for their presentation pre-installed on it and what your Presentation Kit is intended to do is provide the all the necessary adaptors and cables to connect that machine to your projector and sound system, plus provide a few extra useful tools. What else have I missed out??? If you have any further ideas on what can be included in a Presentation Kit for Apple User Groups, contact Nicholas with your suggestions and they can be incorporated in an update to this article.